Five years earlier, the tiny house movement had started in Tokyo. Recently, a handful of U.S. communities, including Spur, Texas, and Berkeley, California, have modified their zoning rules or building codes to accommodate them. The laws are a patchwork: houses on wheels must sometimes be classified as RVs, and some cities set size minimums for houses with foundations. Young adults who want to buy tiny houses can encounter another obstacle: difficulty obtaining a home loan, even at their more modest prices. 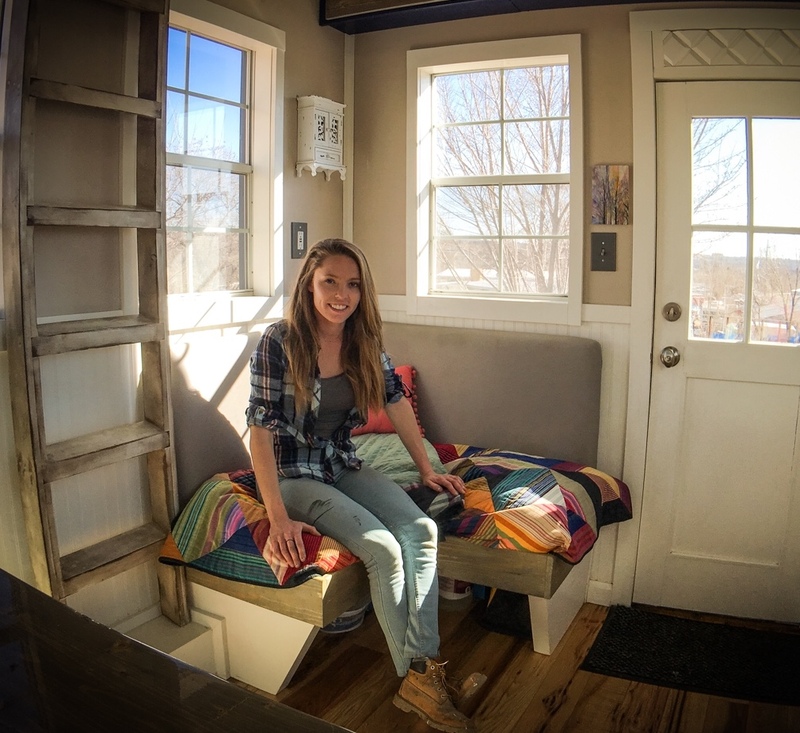 Patterson has the edge over most Millennials who might want a tiny home: she’d trained as a carpenter before college and could build – rather than borrow and buy – a place. Around the same time she was spinning her wheels professionally, she began to realize that she’d rather work as a carpenter. That, in turn, led to the Eureka moment: she would use her skill to solve her financial problems and get a house. In 2014, she sold her worldly possessions, bought a flatbed truck through Craigslist, and started collecting high-quality building supplies discarded from luxury properties – pine floors from the Black Hills and some awesome outdoor sconces from a Kansas farmhouse. Patterson has used her financial freedom to buy an extravagance more typical of baby boomers: travel. In two years, she has visited New York City, Chicago, Boston, New Orleans, and Santa Fe. For the first time, she has money in the bank. She’s saving up for her own acre of land, though she still has a long way to go. Her next plan is to someday sell the tiny house, pocket the profits, and build another tiny house on that new plot of land. But Patterson has already achieved her American Dream. “I haven’t lived paycheck to paycheck since 2014,” she said. I have to admit – I only clicked on this article link to see this flatbed truck. She bought the flatbed to pick up supplies. Geez, give her a break! No shots were taken at her, so no break needed. She did a great job. Just noting that the wording in the article that peaked my interest was building a tiny house on a flatbed truck. Little misleading there. I thought the same until I got to the part about the supplies. I was curious to see the results if done on a flat bed truck, think there might be some height issues. Dear Engineer Artist – you’re right. It’s a trailer, not a flatbed truck. Not sure why I said that but sorry readers! I didn’t get into where to locate these tiny houses, because I am a personal finance blog – and was mainly focused on that. But I got the impression that the city or town where you’re interested in locating will no doubt have rules or zoning regs about it. Thank you for looking at our personal finance and retirement blog. What a wonderful story about a beautiful young woman who deserves much praise for her talent and ingenuity…Hard to believe your previous commenter zoned in on a tiny part of the tiny house story that was insignificant. The main point of the story was Ms. Patterson’s accomplishments. This story also brought to mind the plight of so many baby boomers who are downsizing and realizing that even their children don’t want the things they treasured and accumulated over a lifetime. So true! At 70, I find my home and life over run with stuff! From children’s cribs and toys in the attic, to collectible things from my parents’ 70-year marriage! Precious to my life and memories, but my child is making her own. Purging has been heart wrenching and frustrating and long overdue! I want my children to collect experiences and memories…not stuff! Different world for them. Who wants to work for stuff? In the end you can’t give it away. So true and so well said! I admire young adults for realizing this before they started collecting and wasting money on things instead of experiences, memories, and people. Would love to see pictures of the inside. Does she have the building plans for this tiny home? Interesting. My first question about this trend would be about the legality of such a tiny house because, in this part of the world, parking the trailer would be a big issue. I understand if the house is located in a property that is owned by the inhabitant. And if that is the case, then the money woes are nowhere out of the picture. Great article! Tiny houses are becoming very popular with younger generations who want to save their money for travel. I have a tiny house and was looking for land near the area I grew up in. What a great gal! To be free of heavy financial burdens right off the bat is commendable! My husband & I are nearing retirement age in a few years & this would be a great option for us! We are Baby Boomers, & yes, we have a lot of accumulation that we are getting ready to sell off. Stuff cost money, clutters, most is not needed, & drags you down. Family,& living comfortably is more important than stuff. How freeing! I am very excited for you! 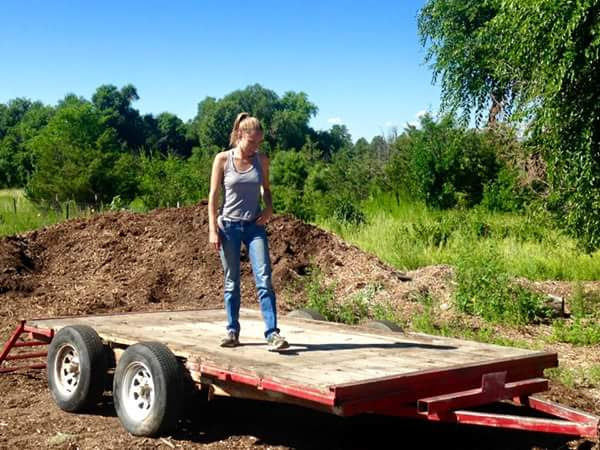 I also am building my own Tiny house on a 20″ tumbleweed trailer. Progress is going slow but steady. I too want financial freedom. Good luck in the future. I am interested in purchasing your tiny house. So proud of you. My son is 29 and would cherish your tiny home built with love. Where is she living? How? 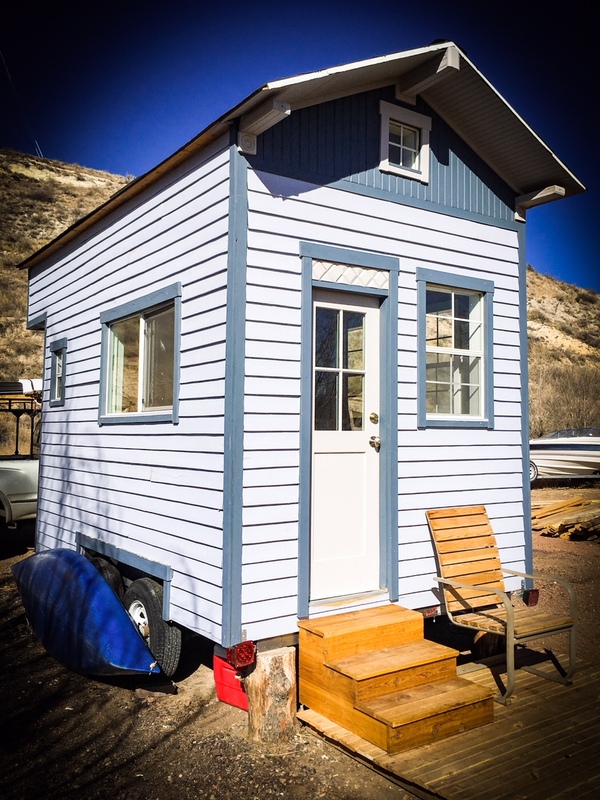 Major upset regarding the tiny community is where you can actually “live” in your tiny home. Was this land that was owned by a relative and she’s living in it? Did it already have water and electric hook up? I appreciate the article, but for me as a person who doesn’t just think tiny living is cool and hip and is actually pursuing that life, is the actually land wise, community wise, where and how. Thank you for asking that question. I’m interested in making a tiny house my home, but how to go about it is an issue it seems. Like, how to get started, where can the materials be obtained, where will it be located ultimately, how will the water/sewer systems work, is special license or insurance required, what will minimally and realistically would I need financially to sustain the house? Just looking to get some guidance on starting this process. Thank you. New definition of “home-maker”! Lovely job! I’m dreaming of the day that I can do this too! I’m one of those baby boomers that felt the need to acquire stuff. I want freedom from paying ridiculous rents. It only takes one incident to lose everything you worked so hard for and then realize that you just threw all that money in the trash. I currently pay $1,575/month to house four people and we barely get by each month. I’ll keep dreaming and working towards my goal. Yes, another “Fabulous Freedom Story” without the details. Where is she parking the Tiny House. What about electric, water and septic system? How is this being heated? None of these “Fabulous Stories” ever get down into nit & gritty, day-in-day-out real life facts therefore such stories read like puff-pieces. Thanks for posting an article about Ms. Patterson’s inspiring story. I admire her for giving herself permission to think outside of the box on something that is usually fraught with angst — acquiring a place to live. My fellow commenters have made some good points, above. I hope you can post a working url for the photos of her house. I share the questions about where to park a tiny home (legally) and how the issue of connecting to all the usual utilities is done. As the fellow comment guests asked; what does she do for a toilet, running water, shower, septic & codes/permits? I would assume she’s using a compost toilet. I’ve been a fan of tiny houses from the beginning. A few years ago I went through my house to eliminate unnecessary items. My purge yielded 42 grocery bags of stuff as well as lamps and other larger items! Through my local consignment store I made $700. I have a 14 room house which feels like an elephant on my foot. This 70 year old lady can’t wait to go tiny. My hats off to you youngsters. Go for it! Great article, one that I can share with all of the people in my life that don’t get the whole “Tiny House” movement or lifestyle. Half of those aforementioned peeps have big houses, PLUS storage spaces packed full of crap they don’t ever use (and most of which they couldn’t even list)! Tiny living reduces our greedy human footprints, curbs hoarding, allows more freedom, and is just plain fun! Fantastic construction. It must be so satisfying to create your own house, and it looks cozy. I live in the Netherlands. I wish people would do this here. I am too old now to build one myself, but I still dream about it. I’m 67 and have spent several days in the garage trying to get rid of stuff! This article and contributing comments just helped me go back and let go even further. My daughter has already said the antique memories hold no interest for her. Nostalgia may have its place, but I’ve discovered it just takes up emotional time, and why not get out and live it up in real time! Downsizing allows me to do just that. Thanks for the inspiration! There is an existing paradigm for tiny houses: the travel trailer is actually designed and built to be self-contained and portable. Even a really nice one is not prohibitively expensive, but a tow vehicle is. Then there is the issue of where you can park it. As the previous poster noted, fees at campgrounds with hookups can easily exceed the mortgage payment on a house, and long-term, you have no return at all on your investment. The most cost-effective and environmentally friendly housing is high density, i.e. apartments and condos. I applaud millennials for trying to break away from the bigger-is-better approach to housing, but tiny houses aren’t the answer. I admire this girl for being so smart at such a young age. Good for her! I would love to have a tiny house but my quandary is where to park it. That’s the entire issue. I can’t afford to buy a piece of property so I need to figure that out. I would love to see pictures of the inside of this little home and/or a floor plan. That would have been a great bonus to the article. Thanks for sharing.